This publication was published by The Pennsylvania State University Ag Communications and Marketing and prepared by Kathleen Demchak (senior extension associate in horticulture), Jayson K. Harper (professor of agricultural economics), Lynn F. Kime (senior extension associate in agricultural economics), and Willie Lantz (extension educator, University of Maryland Extension). 1. A very brief description of strawberry production is presented. 2. A discussion of the different marketing options are also discussed. The pros and cons of roadside stands, farmers’ markets, pick-your-own operations, and other marketing options are reviewed. While specifically tailored to the market conditions found in Pennsylvania, this overview touches upon keystone considerations for any prospective entrant into the strawberry-growing business. 3. The various variable aspects of growing strawberry plants are discussed. 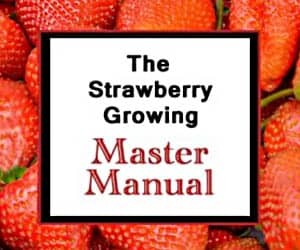 Other resources are referenced for more specifics on the different agricultural tasks that must be attended to in order to facilitate healthy and productive strawberry plants. Site selection criteria are discussed as well. 4. The production of June-bearing strawberries is also highlighted (see the Strawberry Varieties page for more information). Matted row cultivation is contrasted with plasticulture cultivation and each are discussed. The specifics of layout and planting procedures are discussed. Additionally, an informative table listing appropriate strawberry varieties to grow in each strawberry production system is presented. 5. Recommended strawberries for Pennsylvania are given. The recommended strawberry varieties for matted-row production are: Allstar, Darselect, Earliglow, Honeoye, Jewel, and L’Amour. The recommended strawberry varieties for plasticulture production are: Camarosa, Chandler, Sweet Charlie, and Wendy. The recommended day-neutral or everbearing strawberry varieties for plasticulture or matted-row production are: Albion, Everest, Evie-2, Seascape, Tribute, and Tristar. 6. Multiple factors involved in the production of strawberries are also discussed. Pest management and harvesting considerations are reviewed. Local regulations, budgetary considerations, and risk management information is provided. A detailed table of typical expenditures is also presented. 7. A list of references for further investigation is provided to end the publication. To find out which strawberry variety would grow well in your area, see here: Recommended Strawberry Varieties by State.